Making learning about commas fun!!! This is an idea I had to help take what many students believe to be a boring grammar topic and make it into something fun and engaging for students and the teacher! The PowerPoint begins by informing students that they are being sent on a mission to help NASA. 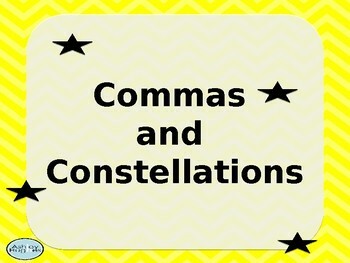 Stars (commas) have fallen out of their constellations (sentences). 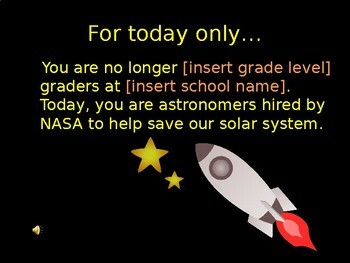 NASA needs their help to return these stars to their correct places in the constellations. 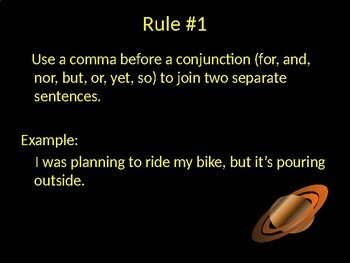 The PowerPoint takes students through the correct rules for comma usage and then leads students through practice sentences in which students must return the stars (commas) to their constellations (sentences). 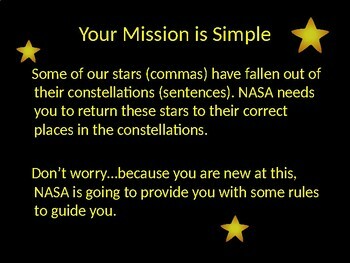 The last page actually has stars with commas inside of them that you can print and cut out for students to use as they approach the board to tackle the practice sentences.